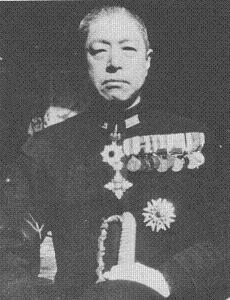 Shima Kiyohide, a rear admiral in command of Minesweeper Division 19 at the start of the war, commanded the invasion of Tulagi during the Battle of the Coral Sea. He later commanded a small cruiser-destroyer force that was sent by a wildly over-optimistic naval command to finish off the remnants of Halsey's Third Fleet after the aerial battle of Formosa in 1944. In fact, Halsey had pulverized Japanese air power in the area with no more serious loss that two badly damaged cruisers. Shima smelled a trap and retreated, saving his force from certain and pointless destruction. Shima was later assigned to join Nishimura's force during the Battle of Leyte Gulf. Due to the poor communications that prevailed among the Japanese units participating in that battle, Shima never caught up with Nishimura's force, and when he spotted its few survivors retreating from Surigao Strait, he prudently joined them. At that time, things flashed in my head were thus: ... If we continued dashing further north, it was quite clear that we should only fall into a ready trap. By 1944, physical courage in the Japanese Navy was tantamount to suicide. But the Japanese considered suicide in the Emperor's service a virtue.